My husband told me the other day that he had a dream about fibroids and pomegranates. In the dream he was telling me that pomegranates would fix my fibroid problem and so I needed to eat pomegranates if I wanted to get rid of my fibroids. I grew up picking pomegranates directly off pomegranate trees. Since I’ve been in America (I’ve been here a long time) I’ve only bought an actual pomegranate from the grocery store a small handful of times. I have hazy memories about the pomegranates that grew on my grandmother’s neighbor’s tree. I got to try some one year and I remember them being the sweetest and juiciest pomegranates I had ever tasted. Needless to say I am going to be putting pomegranates to the test to see if in fact the pomegranate can do anything to help me in my fibroid battle. After all you never know right? There is already a link established in material on the Internet suggesting pomegranates can help in the fight to shrink fibroids. I’ll admit I am not surprised. At this point I think you can find material on the internet suggesting everything and the kitchen sink can help in the battle to shrink fibroids. I have long stopped concerning myself with such questions as whether or not there is any evidence. I figure if it’s something I can afford to try and trying it won’t harm me in any way then why try to find printed material to support the notion that it works knowing that for every comment I find saying it works I’ll find one saying it doesn’t? Why not try it and find out for myself? Trying doesn’t mean I am a gullible fool who believes everything she reads. I am far from being that; but I do believe that you should never say never. Or at the very least you should maintain an open mind to any and every possibility. And in this battle with fibroids I am willing to try almost anything even while I maintain the necessary healthy skepticism. Or as is usually the case, I plain old know it’s not going to work but I’m desperate enough to try and hope for a miracle anyway. So I am shopping around for Pomegranate Seed Oil. I figure the oil will be good to try in my baths as an external aid. I also want to try it in my hair and face cream. I’ve been making my own hair and face cream using cocoa butter, shea butter, coconut oil and aloe in an effort to reduce the amount of chemicals that potentially get into my system. The cream has been working wonders for my skin and hair. I’ve been wanting to add some other oils and I’ve read that Pomegranate Seed Oil is good for the skin. If that proves true it can also indirectly help in the battle with fibroids. How might Pomegranate Seed Oil possibly help in the battle with fibroids if being used in face and hair cream? My logic is this: I’ve found that when I feel ugly, I lose my motivation to take care of myself. When I don’t feel good about myself I workout less and I stress eat; and the more I do this the worse I feel. The worse I feel the worse I treat myself and naturally the worse I look. I know that I’m over forty and so there’s only so much I can expect. But sometimes I look in the mirror and I get seriously depressed by what I see. I know that much of this is a psychological issue and something I’ve been dealing with my entire life. I’ve always had a problem where I would sometimes look at myself in a mirror and become depressed because I looked ugly to myself. My body image issues aren’t just limited to weight. I’ve also had a problem of being ashamed of my looks, thinking I’m ugly, wanting to hide my face–not wanting anyone to look at me because I feel like they’re seeing how ugly I am. Ultimately what’s important is being able to look at yourself and love yourself regardless of how you look; but I was taught to hate myself for every flaw. And I have a lot of flaws. The point I’m trying to make here is that it’s important for me to do what I can to improve my appearance because I struggle to love myself as it is; and the struggle gets harder when I look in the mirror and I see a tired, broken down old lady looking back at me. I get depressed and I lose my motivation and my fibroids love that. They love when they are given control and left to run the joint. So I have to make use of any and every little way in which I can boost my sense of self. And I feel better about myself when I look attractive to my own eyes than when I don’t. So I need to do everything I can to maintain my external physical appearance because that directly impacts on my state of mind and my state of mind impacts on my internal health. There is no question in my mind that the condition of my fibroids is affected for better or worse by where I happen to be mentally and emotionally. The better I feel about myself and about my life, the less of a problem I have with the fibroids. So if pomegranate seed oil has the skin benefits they say it does then it could help me indirectly in my battle with fibroids. Naturally it’s the pomegranate juice that is suggested to be of direct benefit in helping to battle fibroids. I won’t bore you with all the claims. You can google and read up on it to satisfy your need to know about the actual suggested benefits. You’ll be coming across the usual claims of the fruit being high in anti-oxidants, being the perfect food for balancing estrogen levels, containing all these wonderful minerals and vitamins and all that jazz. I’m really just trying it, seriously, because my husband had a dream about it out of the blue, woke me up right after the dream and told me about it. Like I joked to him, wouldn’t it be something if it turned out he dreamed the cure to my fibroids? Do I really believe pomegranates will get rid of my fibroids? At this point I honestly believe I’ll have my fibroids until menopause; but I am not going to quit trying to get rid of them before that time. I am sick to death of walking around with a protruding stomach. I know there are plenty of women who do walk around with a protruding stomach who aren’t pregnant and do not have fibroids. Therefore, it’s really not the end of the world; but even so, there are things in my stomach that don’t belong there and I would like to get rid of them. And I shouldn’t have to risk my life by having doctors cut me open to take them out. They weren’t always there. It shouldn’t be the case that I can’t get rid of then naturally. Anyway, I am going to the grocery store today and will pick up some pomegranates and pomegrante juice if I can find either. I will be ordering the pomegrante seed oil via the Internet. 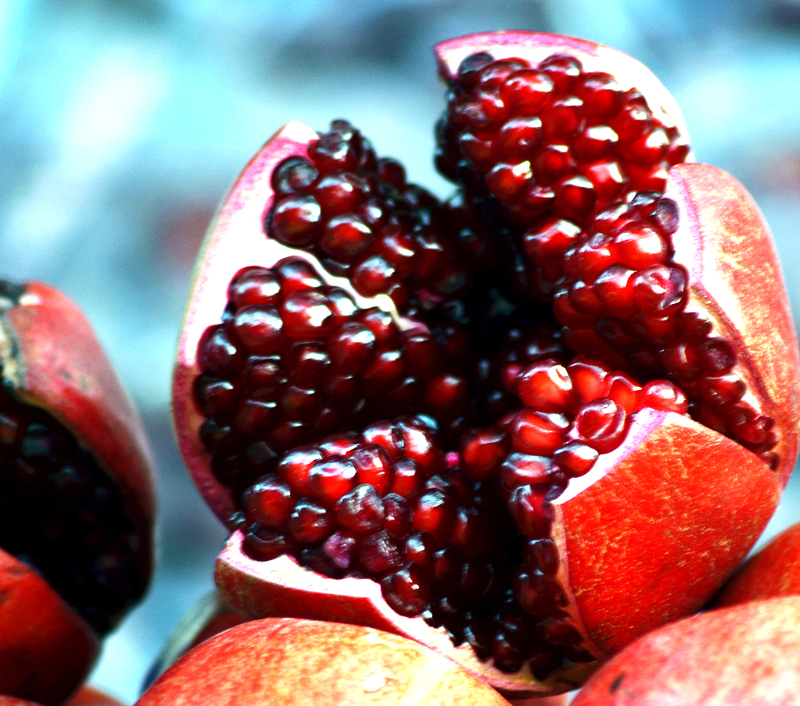 Image Attributions: “Pomegranate DSW” by Augustus Binu/ facebook – Own work. Licensed under CC BY-SA 3.0 via Wikimedia Commons. Do you have an update on how well the pomegranates worked for you? Hi Tamara, I came to the conclusion that the pomegranates were not such a great idea. Too much sugar at the end of the day. I can’t say they did any specific damage but they did not play any direct role in helping my situation.